The first Radisson Blu in North America came to Chicago recently and I was invited to check it out with a group of fellow journalists. 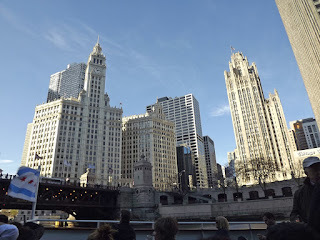 While I always enjoy visiting a new hotel, I was just as excited about the opportunity to play tourist in Chicago as I am still discovering the city. My room was modern and, yes, blue. 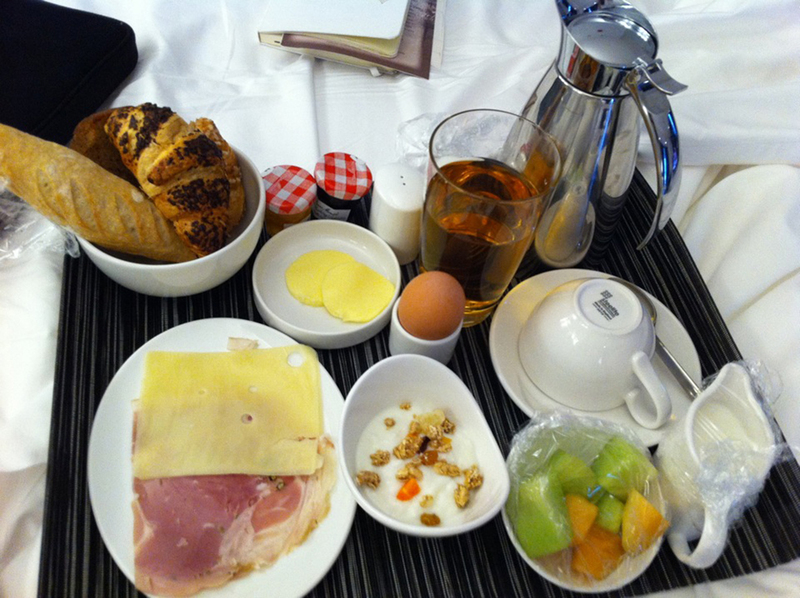 I had arrived late at night and didn’t really have time for dinner, so I was ready for a big breakfast. The room service spread certainly fit the bill, supplying a fresh selection that was more than I could finish. I had a bit of time to relax and digest before the official luncheon when we were introduced to the Radisson executive team, as well as Meghan Risch of the Chicago Convention & Tourism Bureau. 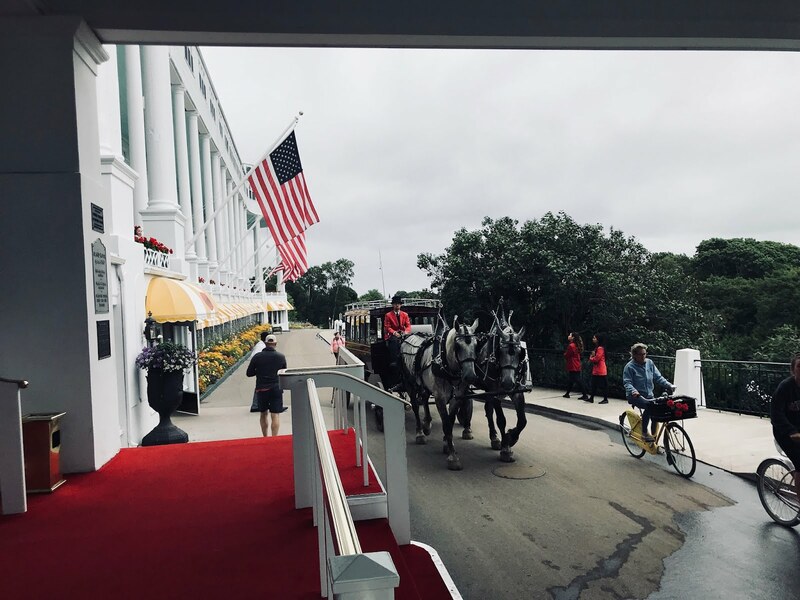 We learned about the hotel brands of Carlson -- Hotel Missoni, Radisson Blu, Radisson, Park Plaza, Park Inn and Country Inn – while sipping champagne in the very comfortable viewing room of the new hotel. The afternoon was filled with fun activities and we started at the Shedd Aquarium. 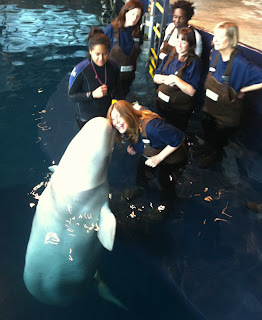 We were given the option of working with the belugas or the penguins and I was excited about getting in the water with the whales. After we had our own training session, we got into our waders (basically a thick wetsuit with boots attached) and climbed into the 55 degree water. 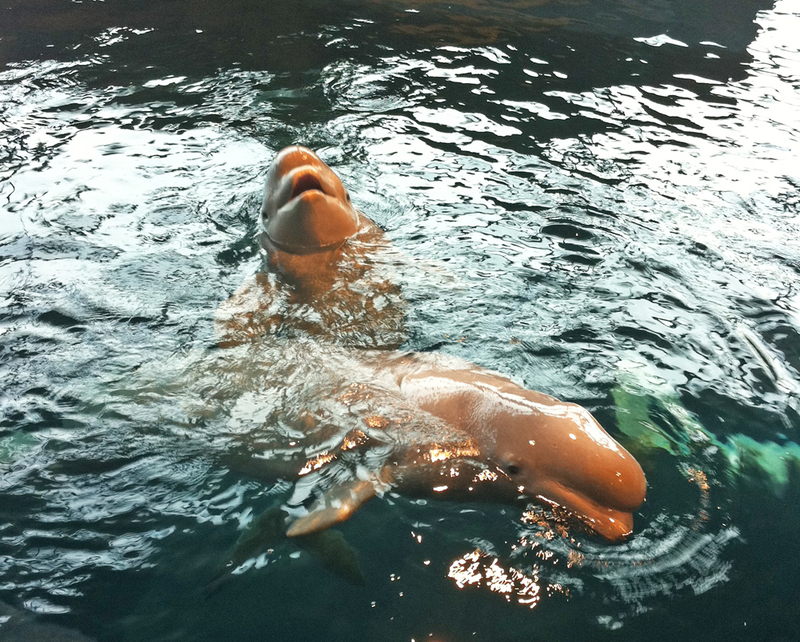 There are six beluga whales in residence at the Shedd Aquarium and they all take part in these training sessions, which are available to the general public. My small group worked with Bella and Mauyak, both of which were friendly and very patient with us as we went through the training motions with them. It was an incredible experience that I’d love to repeat someday. From the aquarium we headed down to the river for the Chicago Architecture Foundation Boat Tour. 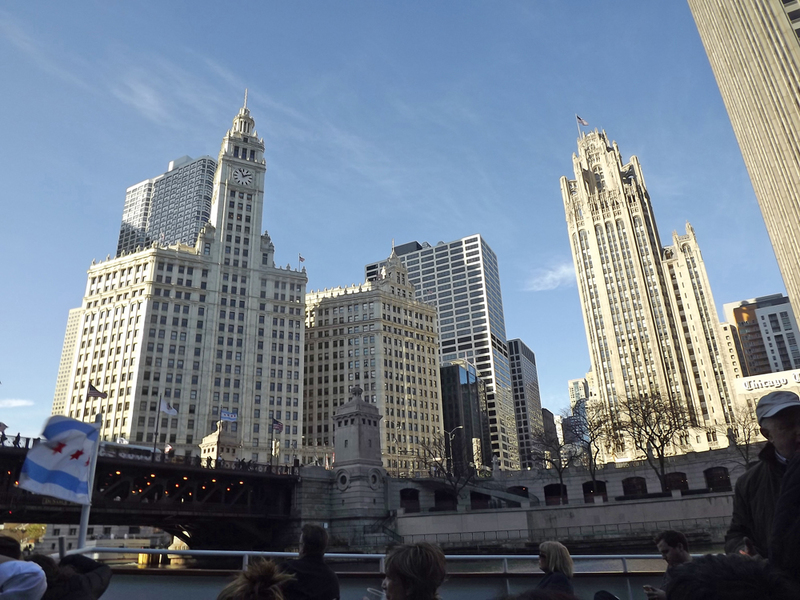 The unusually warm weather was welcome as the boat took us through the history and beauty of Chicago’s architecture. 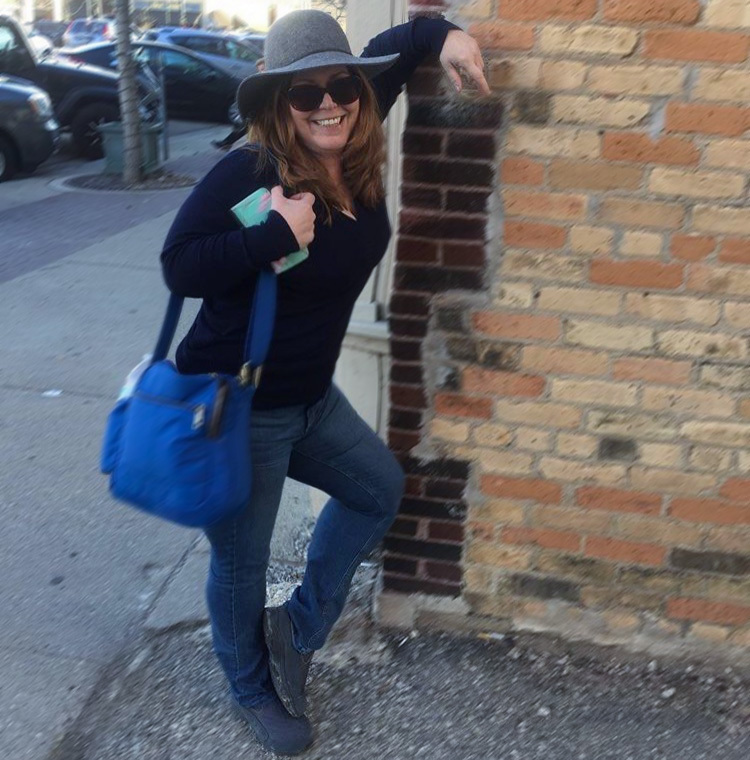 I had heard a lot about this tour and frankly hadn’t put it at the top of my “must do” list, but once on it my attitude changed. The combination of learning about the city through its buildings and appreciating the architectural wonders that only this city appears to have is something all visitors should experience. Our day finished back at the Radisson Blu. We first enjoyed some wine at the Filini Bar, which has a nice selection of both wine and cocktails. We then went upstairs for dinner at this modern Italian restaurant, headed by Chef Christian Fantoni, formerly of the Windy City’s Bice). The meal started with Zuppa Di Pomodoro, a tasty Tomato soup with parmesan cheese and roasted peppers. The appetizer was a combo of two amazing dishes: Aquarello carnaroli, porcini mushroom and parsley Risotto; and Butter Nut Squash Ravioli, with sage, amaretti and parmigiano. While most of the other guests in our group feasted on a Char-grilled Tuna and Olive Oil Poached Halibut, I got my own fish-free dish of Eggplant Parmesan. 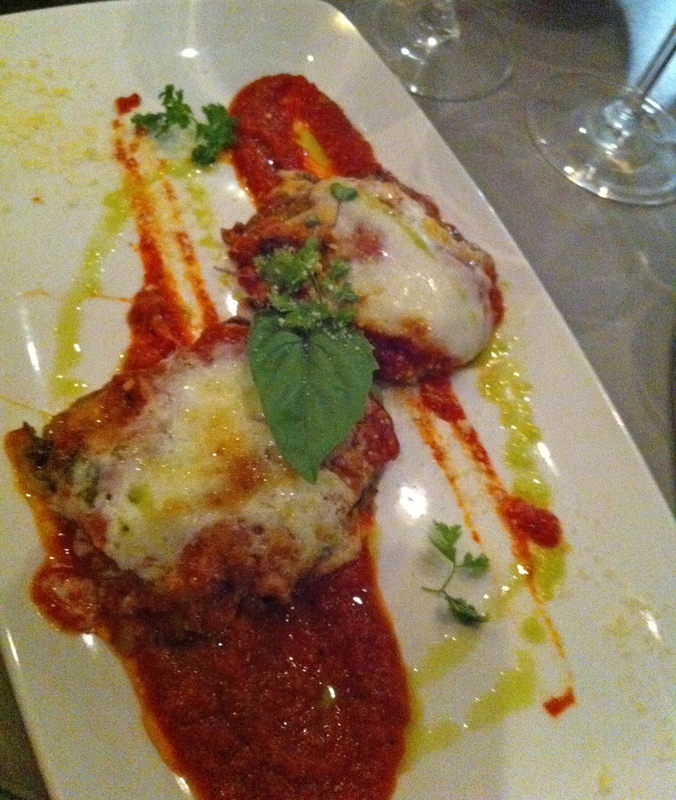 It’s one of my favorite dishes and Chef Fantoni’s version lived up to some of the best, managing to remain light without tasting too fried, breaded or heavily loaded with cheese. For dessert, we were brought an assortment of Italian style sweets: Filini Tiramisu; Cioccolatissimo; and Biscotti. We sampled small bites as we were all pretty full. 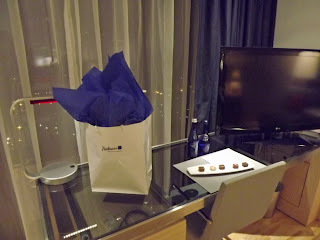 The night ended after dinner for us as we got ready for a second day of discovering the Radisson Blu and Chicago.